My husband as a young teenager joined his older brother’s guerilla group to help rid Luzon of the Japanese in 1945. Alas, the story of the terrible fight, first in the city of Manila, and later against the fleeing Japanese hiding in the jungles and mountains of Luzon, is too often forgotten, overshadowed by those who remember only the atomic bombing anniversaries. 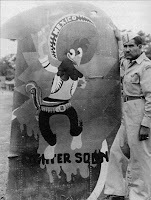 One little known story of that time is about Squadron 201: the “Aztec Eagles” of the Mexican Expeditionary Air Force (FAEM), who fought for the defense and liberation of the Philippines during World War II. Consisting of 33 pilots and over 270 support personnel, this unit, along with a Mexican Expeditionary Air Force (Fuerza AÃ©rea Expedicionaria Mexicana) headquarters, moved to the Philippine Islands in February 1945. In March of 1945 the EscuadrÃ³n 201was attached to the U.S. 5th Air Force and the 58th Fighter Group which was based at Porac, Luzon. 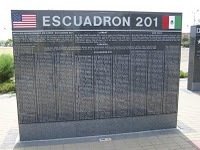 The 58th Fighter Group merged the EscuadrÃ³n 201 into combat operations and provided invaluable support to the new unit during its first combat missions. Throughout June, the campaign to liberate Luzon continued as the U.S. Sixth Army fought north toward Cagayan Valley in the central highlands, where Japanese General Tomoyuki Yamashita’s Fourteenth Army was holding out. The troops advanced through rugged mountain passes above scenic valleys, sculpted with ancient rice terraces and dotted with the thatch-roofed houses of the Ifugao people. The fighting was a brutal combination of jungle and mountain warfare. Close air support proved crucial, and as the fighting moved deeper into the mountains, the 201st’s missions changed from hitting visible targets to striking hard-to-see troops and fortified positions in close proximity to friendly forces. Unless you know the area, you won’t appreciate the difficulties of flying in this rugged mountainous region, or the danger they faced when they patrolled over the ocean to stop the Japanese from resupplying their troops. Another article on their mission can be found HERE and also in this PDF file. After the war, General Douglas McArthur awarded the squadron numerous commendations and medals for heroism in support of the American victory over the Japanese. Mexican cities and towns where patriotic pride erupted everywhere. Town plazas were brightly decorated in red, white and green banners as local townsfolk gathered to catch a glimpse of the famed unit. The Philippines has many ties with Mexico, since both were Spanish colonies and many Mexicans served with the Spanish administration before the US decided to take over the Philippines. The ties of culture, music, food and religion are strong, but until now, I was not aware of this story. At a time when the “Greatest Generation” is disappearing, our grandchildren need to learn these stories. more HEREÂ and HERE and HERE…. Nancy Reyes is a retired physician living in the rural Philippines. She blogs at Finest Kind Clinic and Fishmarket. No user commented in " Remembering the Aztec Eagles "